Basseterre, St. Kitts (February 9, 2016) – Cementing its place as a favorite destination this year, St. Kitts has earned even more placements among top lists for 2016, most recently from Robb Report, Bloomberg, Forbes and USA Today. In addition, the Park Hyatt St. Kitts was named among the 20 Most Anticipated Hotel Openings of 2016 by Forbes. It is one of just three Caribbean hotels to appear on the list.An article on St. Kitts and YU Lounge also appeared in Forbes in last month. Forbes is a leading international publication with a focus on business, investing, technology, entrepreneurship, leadership and affluent lifestyles. It is published in 37 editions globally that has an online readership of 43.4 million Unique Monthly Visitors (UMV). 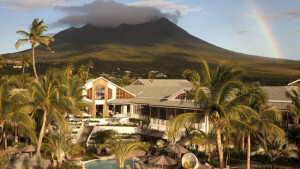 Further, St. Kitts & Nevis have been named #13 on a list of the most popular Caribbean islands among the very rich. Appearing on Bloomberg Business online, it is based on a survey of where the wealthiest 5% and 1% of Americans visit. Bloomberg Business delivers business and markets news, data, analysis, and video to the world, featuring stories from Businessweek and Bloomberg News and reaching 21.5 million UMV. Finally, St. Kitts’ Sugar Mas was rated among The 10 Best Carnivals in the Caribbean in an article appearing in USA Today. The article describes the celebration as “a blend of holiday good times and Afro-Caribbean traditions, with Masquerades, Mummies and Mocko Jumbies on stilts.” USAToday is the the #1 daily newspaper in the US and its website reaches 17 million UMV.